IRON MOUNTAIN — Roland Fred “Rolly” Gazza, 93, of Iron Mountain, passed away peacefully Sunday, Aug. 12, 2018, at the Oscar G. Johnson VA Medical Center. This is what Rolly often heard as he came into a room, or walked into a building; but he would be the first to say that he was actually more bull than trouble. Even more than that — he was one of a kind. Rolly was born in Springfield, Ill., on Aug. 18, 1924. He grew up in Iron Mountain and graduated from Iron Mountain High School with the Class of 1943. One week after graduating high school, Rolly left to Farragut Naval Training Station in Idaho for basic training. 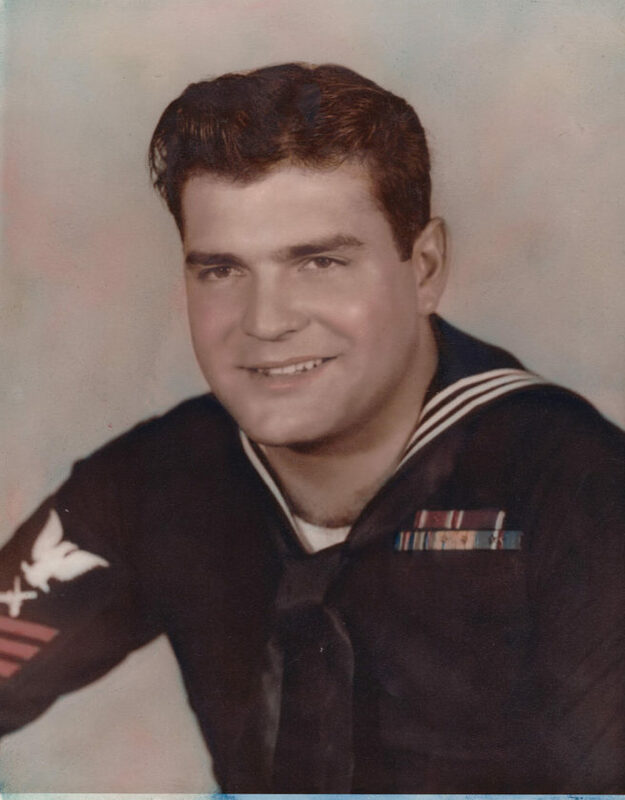 He served in the U.S. Navy during World War II, where he was a gunner’s mate on the minesweeper USS Devastator. It was during this time when a kamikaze plane hit the Devastator and Rolly was injured, earning him the Purple Heart. 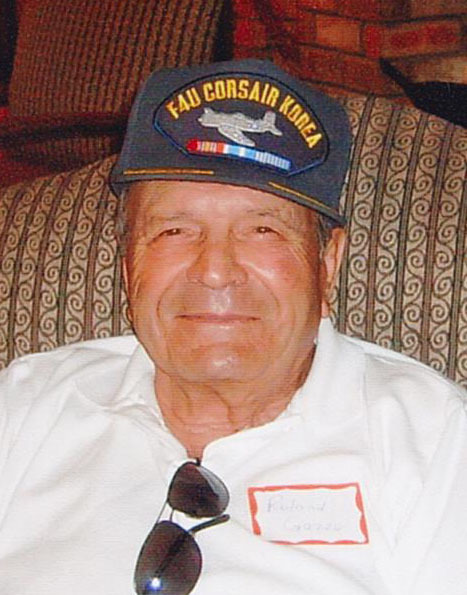 He was then called back to service and served in Korea as a F4U Corsair pilot on the aircraft carrier Sitkoh Bay. While serving there, Rolly was shot down two times, and was part of numerous missions providing close air support to troops on the ground. Finally, Rolly served in Vietnam, where he was one of 13 Americans training members of the French Foreign Legion to fly F8F Bearcat planes. Rolly was a pilot — not only in the service, but also for his career and as a hobby. His love of flying began early on. In fact, when he was a kid, he would go to the airport after school and work just so he could get a 15 minute plane ride! That is one thing about Rolly, he didn’t give up, especially when it came to what he wanted. Some other words to describe Rolly include: Sweet. Fun. Hard working. On-the-go. Martini drinker. Husband. Grateful. Bull-headed. Peanut butter connoisseur. Generous. Shoe lover. Dog owner. Uncle. Car accident survivor. Funny. Veteran. A true friend. Hot pepper eater. Social. Thoughtful. Caring. Kind. Rolly had many interests, but veterans and flying were among those at the top. He belonged to the Dickinson County Pilot’s Association; American Legion Post 50, Disabled Veterans of America (DAV); Elks Lodge 700, and the Experimental Aircraft Association Chapter 439. Rolly is survived by his wife of nearly 62 years, Edie; and nieces, nephews, great-nieces and great-nephews, many, many friends, and his beloved dog, Binky. He was preceded in death by his parents, Tony Gazza and Maria Grace (Battistella) Gazza; one sister Emma; three brothers, Fred (Amelia), Otto (Mae), Joseph (Catherine); and several nieces and nephews. Per Rolly’s wishes, there will be no visitation or services. Erickson-Rochon & Nash Funeral Home is assisting the family. Rolly and his family want to express their gratitude to Bob Peterson and the staff at the VA Hospital (especially Community Living Center staff, home health staff and 4th floor). Rolly thought the world of the staff and he received such compassionate care. Thank you. Now, it’s time for Rolly’s next journey. Condolences to the family of Roland Fred “Rolly” Gazza may be expressed online at www.ernashfuneralhomes.com.